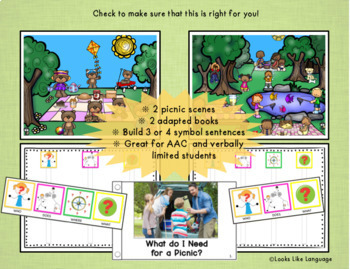 Need visually supported expressive language activities to get your students communicating about picnics and food? 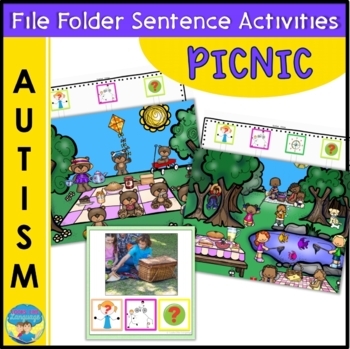 This multi-activity symbol supported set includes 2 adapted books, file folder activities, a sentence game, a sentence building photo activity and cut and glue worksheets! Now updated to use the modified Fitzgerald Key color coding system used by Proloquo, this is great for autism, verbally limited students and AAC! 2- Build sentences using symbols to answer questions about the pictured activities. 3- Play a sentence building game. 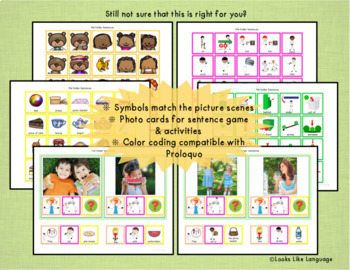 4- 18 sentence building photo cards activity, each with 3 symbols to make sentences. - Going on a Picnic! Fill in missing sentence parts to tell the story of a picnic day. 6- Complete the picture worksheets for varied categorization skills. + Great resource! I've been looking for something to use with the Fisher Price picnic basket. This will be perfect! + Really cute and I like the different options provided. Nice for vocabulary practice each spring when we have a week-long picnic theme. + My students are going to love these graphics and I love all the visuals.